All week long, we’re celebrating Joy of Giving week. Indians have been singled out for being pretty damn stingy with their time and money. In July, Mint carried an exegesis on “Why Indians don’t give back to society.” This is a counter-movement. People all over India are sponsoring chai/sandwiches for the needy, clothing drives, cultural festivals where the institutions are matching raised funds. 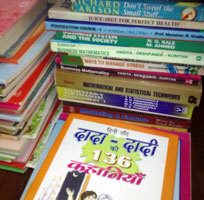 Karmayog is helping with a book donation drive. Who needs books? Well, listen and find out more.